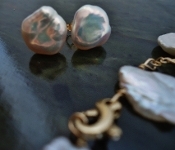 Freshwater Keshi pearls of this size are exceptionally rare. These are the kind of earrings that complement our individual differences. This piece is for my wonderful Mother. She wanted a necklace to complement her Yin Yang earrings, and I was happy to rise to the challenge! I added accents of Peridot for a hint of green and to honor her Virgo precision and intellect. 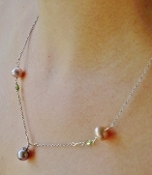 Keshi pearls are pearls that form naturally on a pearl farm. They are a by product of the pearl culturing process and they are fun, shapely, and unpredictable. 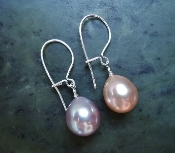 They also have incredible luster, and embody a myriad colors in each pearl. Moveable, light, without being too long or cumbersome, these affordable gems are perfect for Mom! White 8.5-9.5mm Drop Shaped Freshwater Earrings with 14kt White Gold Settings and Pear Shaped Bezeled Peridot.